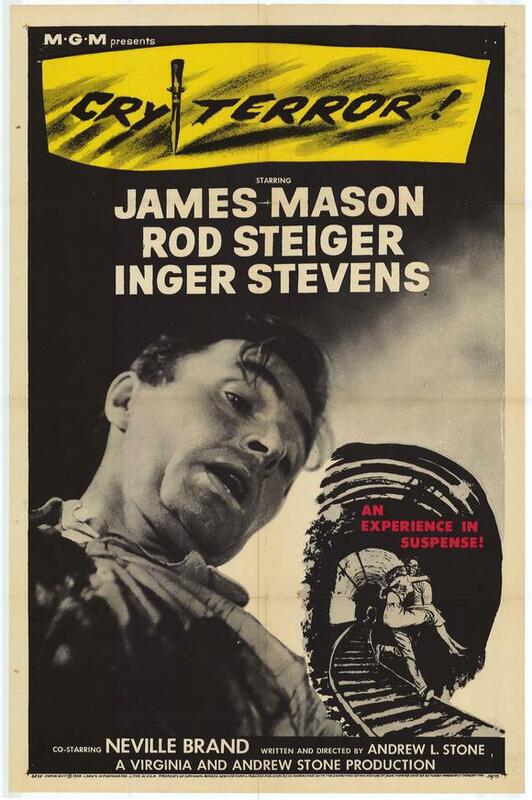 A gang of terrorists (Rod Steiger, Jack Klugman, Angie Dickinson, and Neville Brand) hold a man (James Mason), his wife (Inger Stevens), and their young daughter (Terry Ann Ross) hostage in exchange for $500,000. Cry Terror! remains a reasonably entertaining thriller with an unnecessarily sloppy screenplay. Writer/director Andrew Stone can’t seem to make up his mind who’s telling the story here: about a third of the way into the movie, we suddenly hear a voiceover by Stevens, although she was never posited as the first-person protagonist; later, this is dropped in favor of a sudden voiceover by Mason. Ironically, neither of these is necessary in order to make the story clear, and the entire dramatic arc would ultimately have been more powerful without attempting to get inside the minds of the harried hostages. Beautiful Inger Stevens is appropriately on edge — though ultimately annoying — as the hysterical mother racing against time to save her family, while Mason is pretty much wasted as the brave father who does what he can to help notify the police. The most impressive performances are given by the gang of terrorists, especially Steiger and Dickinson; we can’t help wishing they had more screen time. No. I’m not sure why Peary includes this melodramatic title in the back of his book — it’s not awful, but it’s not must-see viewing, either. A minimally competent ‘thriller’ featuring good actors slumming – and, in the case of poor Stevens, over-acting – due to the forced nature of the script (with, yes, unnecessary narration). Some of the dialogue is incredibly silly and the direction is often quite bad. The occasional genuine tension is there, but basically my mind wandered.